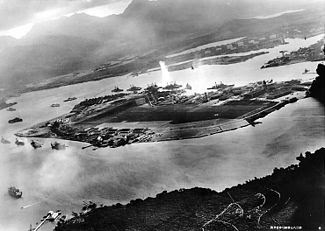 Chatty Kathy: "A Date which will Live in Infamy"
On December 7th, 1941, the Japanese attacked The U.S. Pacific Fleet, at Pearl Harbor. For the Americans, 2,204 were killed and 1,247 were wounded. Franklin D. Roosevelt proclaimed that December 7th, 1941, would be "a date which will live in infamy." Let's take a moment to remember all those who have died fighting for our country! I forgot all about Pear Harbor Day! Thanks for the reminder! I remembered it was pearl harbor day! Kathryn, your great-great uncle, Bob Owens, was stationed at Pearl Harbor in 1941, but his ship, the USS Enterprise, was at sea at the time of the attack. Uncle Bob was killed about six months later when the Enterprise was heavily damaged in the Solomon Islands. I forgot, until I saw all the flag's at half mast! A great reminder. I awarded you on my blog:) please go check it out!